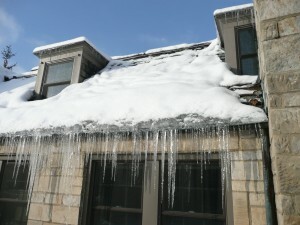 This is the time of year when we may not be fully done with recovering from or repairing the damage caused by last winter’s severe weather, and should be planning our defense for next winter. 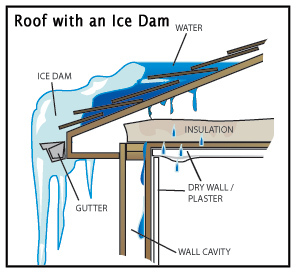 It was a terrible season for ice damming on roof edges, and rough on hardscapes (pavement areas) and landscaping. Another casualty of the past winter has been hardscape areas, which may have been damaged by snow plows, snow shovels, ice choppers, and ice melting chemicals. When using de-icing chemicals on concrete or concrete pavers, only use products that are labeled as “pavement friendly”. Sodium Chloride (rock salt) destroys concrete. Calcium Chloride is less destructive. Surface damage to limited areas such as steps, porches, etc. can be repaired with high-strength concrete repair and re-surfacing materials, a task within grasp of most homeowners. 1. Careful pruning can insure that the tree or shrub is structurally able to survive these loads without a lot of broken branches in windy storms and the coming winter. 2. Planning “snow storage” space should be part of your landscape plan to avoid burying your plants under glaciers of ice and snow. 3. Fertilizing at appropriate times will avoid late fall soft new growth that will not be survivable. 4. Heavy mulch in late fall to keep their feet warm and moist, especially important for broad-leaved evergreens. Mulch applied too early will trigger a growth spurt that will not be ready for winter. 5. Timely applications of Wilt-Pruf, a sticky Elmer’s glue like anti-transpirant that is sprayed on will act as an overcoat to limit the plant’s need for water when the ground is frozen, minimizing desiccation. 6. Plants should end the growing season with adequate soil moisture, since below ground growth continues during the winter.